In this book, relying on current consensus ideas about minds, I present the best case for thinking that plants do not have minds. Along the way, I unearth an idea at the root of that case, the idea that having a mind requires the capacity to represent the world. In the end, I defend a relatively new and insightful theory of mind that rejects that assumption, making room for the possibility that plants do have minds, primarily because they are alive. Throughout, I assume that you, my reader, do not have special knowledge of plants or minds. Thus, I aim to introduce the big ideas to you, making suggestions for further exploration in my footnotes (3; emphasis in original). In reading this book, the challenge is to recall its scope and intended audience. If you do, then there's much to like about it, and it would be perfect for an undergraduate course in the philosophy of mind, as it introduces students to many of the main theoretical issues in that field: substance dualism versus various forms of physicalism; theories of representation, perception, memory, and action; even a brief history of psychology. The question of whether plants have minds could be pitched as be an interesting test case, a way of exploring why and when we should explain phenomena using mental vocabulary. Moreover, Maher is an admirably clear and engaging writer, and he's careful not just to explain jargon, but also to make sure that the reader has a handle on the logical structure of the arguments that he's making. For instance, when distinguishing two philosophical theses that, superficially, sound a bit similar (the claim that all living things have minds and the claim that all minded things are alive) he pauses to point out that a general truth is relevant here (that all A's are B's doesn't imply that all B's are A's), which is the sort of aside that's certainly welcome in a text for students (121). Finally, the chapters are just the right length, the text is beautifully illustrated, and the overviews of plant physiology and biochemistry are fascinating. In short: Plant Minds is a lovely and accessible text for the uninitiated. At the start of this book, I admitted that the idea of plant minds initially seemed silly to me… Having now looked more closely, I have changed my mind… Enactivism makes it plausible that plants and other organisms have minds. This is a substantial and welcome advance beyond what should be regarded as a thoughtless dogma in mainstream cognitive science and mainstream ('Western') philosophy of mind, the idea that mine has nothing to do with life, as if it is just an inexplicable and uninteresting accident that only living things have minds (127). 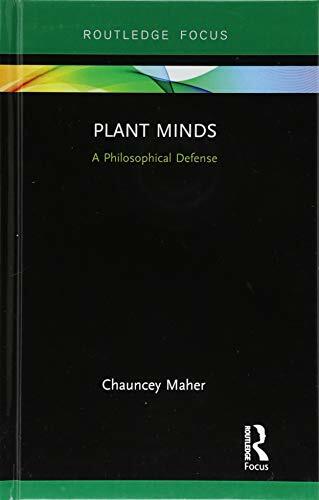 Does Maher establish that it's "thoughtless dogma" to deny that plants have minds? After all, it may be plausible that plants have mind if enactivism is true, but how strong is the case for enactivism? Does Maher say enough to justify accusing mainstream thinkers of making a mistake if they write off that position -- and the hypothesis that plants have minds -- as silly? Not obviously. Here, in brief, is the main worry. According to enactivism, an organism has a mind just in case "they are able to adjust their self-creating processes in response to changes in their environment, which can be more or less favorable in various ways" -- that is, they are "autopoietic" and adaptive (72). The thought here is that if organisms have these capacities, then that's sufficient for them to "'enact' or disclose a value-laden world, an environment or niche, an array of things that matter in various ways," and such "enacting" or "disclosing" is sufficient for mindedness (115). Of course, all living things engage in self-creation and adaptive behavior, and so by the lights of enactivism, all living things have minds. Terminological disputes are, quite often, among the least interesting in philosophy. What matters is that we know what we're saying, and as long as we're all clear about how we're using our preferred terms, we can usually tolerate disagreement about which usage is best. This case is no exception. If some people want to use the term "mind" in an expansive way, the world won't grind to a halt. But those who favor the broad usage shouldn't be surprised when their views are written off as silly by those who use the term in a narrower sense. For most people in cognitive science and the philosophy of mind, mental states are interesting precisely because it's difficult to explain certain phenomena without them; simpler mechanisms don't suffice. As a result, most people think of these states as drawing the line between two different kinds of systems. In the case of bacteria, we can explain everything that needs explaining without recourse to states like wanting, fearing, believing, and so on; in the case of chimps, we can't. So, we attribute mind to the latter, and not to the former. And as Maher concedes -- indeed, argues -- we don't need to appeal to representations, or feelings, or intentional actions, to explain anything that plants do. Hence, given the reason why most theorists invoke mental states, it seems silly to describe plants as having minds. Granted, the above doesn't show that we couldn't have good reasons to attribute minds to plants. However, it does help clarify why it's tempting to want much more from Maher than he offers. True enough, we could take up a perspective from which it's plausible that the difference between a dogwood and a dog is one of degree, not of kind, and we could adjust our language accordingly. But it isn't clear why we should. Bob Fischer is an assistant professor of philosophy at Texas State University. He is co-editor of two volumes--The Moral Complexities of Eating Meat (Oxford University Press, 2015) and Modal Epistemology After Rationalism (Springer, 2016)--the sole editor of College Ethics: A Reader on Moral Issues That Affect You(Oxford University Press, 2016), and the author of Modal Justification via Theories (Springer, 2017).